The Feminist U.N. Campaign issued its second annual report card assessing U.N. Secretary-General’s progress towards building a gender-equitable United Nations. The Campaign recognized his efforts with a grade of B-, up from C+ at the end of his first year. The review notes that, in his second year, Secretary-General Guterres increased public messaging on women’s rights and gender equality, was on track or ahead of schedule to achieve gender parity in U.N. leadership and was rolling out a number of efforts to address sexual harassment and gender-based violence — although internal backlash and bureaucracy threatened progress in a number of areas. The authors warned that progress is anything but assured. 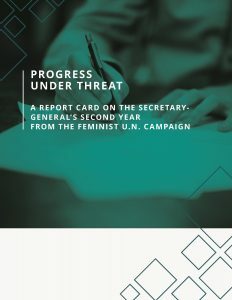 Initial actions taken by the Secretary-General to implement structural changes to promote gender equality have met considerable resistance — from staff and from member states — and the Secretary-General has not prioritized action on a number of issues the Campaign has put forward on its agenda.